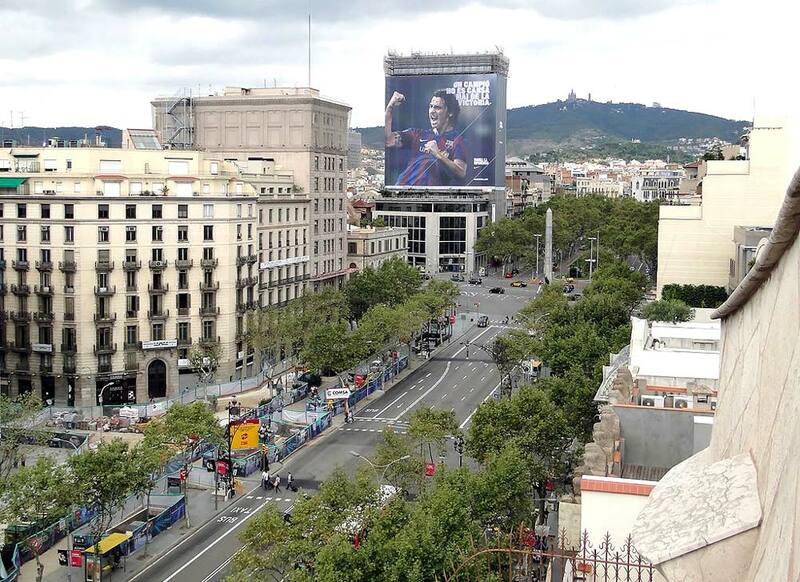 Passeig de Gracia has been a historical fixture in Barcelona, Spain for over a century. Located in the middle of Eixample, it is an important road that goes from Placa Catalunya to Carrer Gran de Gracia. In addition to its rich history, Passeig de Gracia is lined with high-end retail stores, expensive boutiques and booming businesses. Passeig de Gracia used to be a country road adorned with pastures and flowers that connected the towns of Barcelona and Gracia. In 1821, Barcelona was in the midst of many disasters, including the fall of its government at the time. A plan was put in place to boost urban development into Barcelona. The project was quickly halted, but restarted in 1824 when a new and more powerful government took over. The new project was led by Jose’ Bernaldo de Quiros. The street was then widened in order to allow rich diplomats and their horses to ride through in comfort. Pere Falques I Urpi’ was the architect who, in 1906, designed the street’s intricately decorated benches and lights. By this time, Passeig de Gracia was a favorite of famous artists as it had beautifully designed buildings by some of Spain’s most famous architects. The famous avenue has long been known for its expensive shops that line the street. Many of the most influential designers in the world have a shop on this street. For example, Chanel, Zara and Yves Saint Laurent all have a location here that draw in locals and tourists alike. As a major tourist destination in Barcelona, this vital thoroughfare houses many of Spain’s architectural masterpieces. The work of Antoni Gaudi, a prized architect from Spain, can be seen here. Gaudi’s distinctive style, like La Pedrera and Casa Batllo, can be seen up and down the streets of Barcelona. In addition, the traditional restaurants and thriving business district make Passeig de Gracia a significant part of Barcelona’s economy.